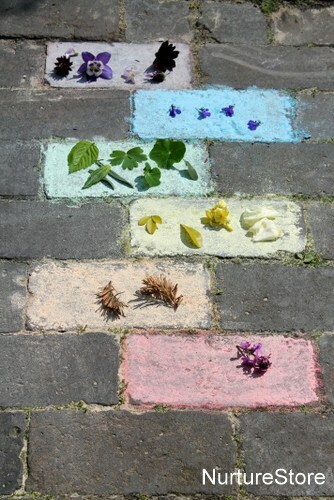 We’re out in our Garden Classroom today, enjoying some outdoor learning with a color matching game. This color matching game is very easy set up and lets you explore lots of different natural materials for some sensory learning. 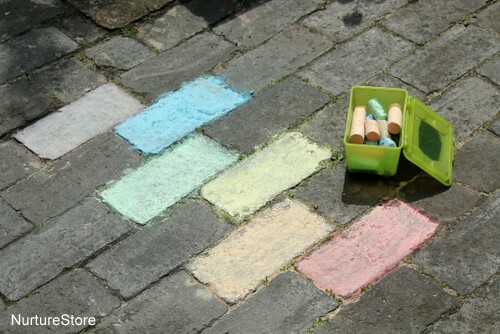 Begin by using chalk to draw some color blocks on the floor. 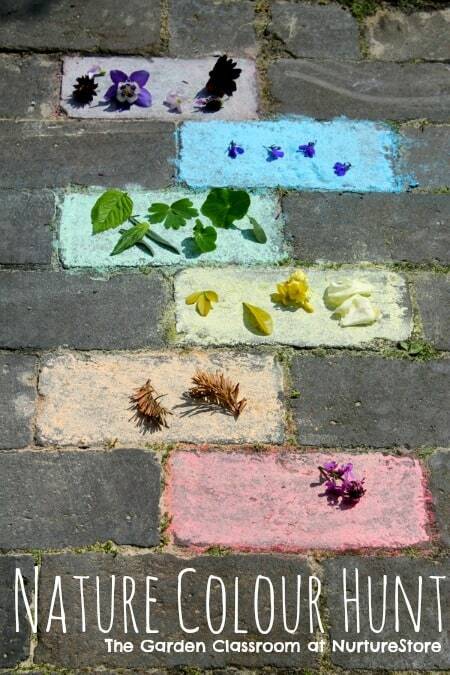 We made a kind of hopscotch grid, but circles or a rainbow are good too. We’re playing outdoors in our Garden Classroom, but you can just as easily play on a school yard, driveway or even indoors. Then we had a look around the garden to see what colors we could find. 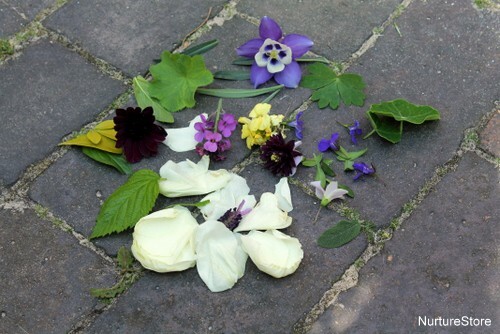 It’s up to you whether you invite your children to pick freely from the plants growing in your garden, or whether you provide a selection for them to use. You can talk about the names for all the colors, and see if you have things in your garden to match all the colors of a rainbow. Then you can play the color matching game. See if you can find something to match each of your color blocks. Are some easier to find than others? 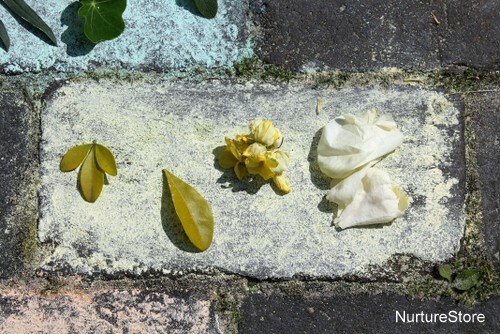 Which color is most abundant in your selection of plants? Which color is the children’s favorite? Are all the leaves green? 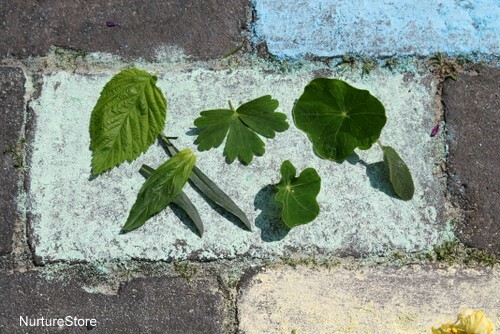 You might think about classifying the leaves in different way – they are all the same colour, but how might you split them into different groups by shape or size? Can you find some leaves that aren’t green? Maybe the children will carry this idea into their next art session, and explore painting trees or plants in different colors. And talk about shades too, introducing words such as light, dark, bold, vibrant, cool, warm, pale. 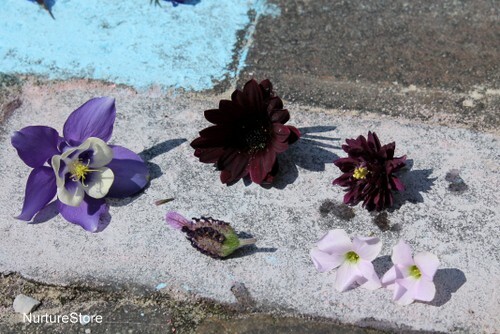 What words do the children use to describe the flowers’ colors?